In spring and summer, song sparrows are easy to locate by their musical songs. Here's a song I recorded in spring. You'll hear a long phrase, three times, each separated by a pause. But now that the song sparrows have fallen silent, they're harder to find. They blend in with the browning leaves of the forest, silent and invisible. 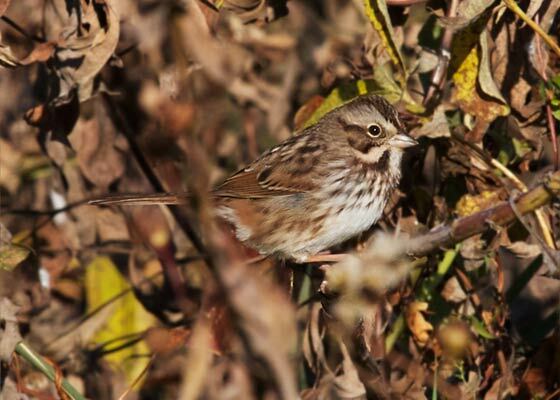 Half the years I've tracked the birds of my present back yard, three years out of six, one song sparrow has stayed around my yard through the Iowa winter. 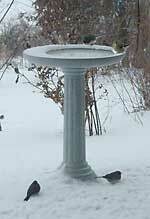 It comes for seed spilled from hanging feeders and seems to enjoy the heated birdbath. I hope it will stay this year.